In developed countries, infectious diseases accounted for most deaths until very recently. And in developing countries, infectious diseases remain the cause of death for a large percentage of the population. It is in this setting that the discovery of penicillin in 1928 by Alexander Fleming was so instrumental in shaping modern health care. For the first time we had a reliable weapon against common infections; this was the start of the antibiotic era. As in many instances, there were clues in history that soil had healing properties for skin and wound infections. Healers in ancient Greece, India and Russia used mouldy poultices (a moist package of herbs wrapped in cloth) to treat wounds. It was only in the early 1940s that laboratories such as Pfizer and USDA Northern Regional Research Laboratory developed methods to scale up to commercial production of penicillin. The importance of penicillin is underscored by the fact its development yielded Nobel Prizes for physiology or medicine and chemistry in 1945 and 1964 respectively for the scientists involved in its discovery and development. One of them was Australian Howard Florey, who then prime minister Robert Menzies described as the most important man ever born in Australia in terms of world well-being. The impact of penicillin after its discovery was immediately relevant. Its use in the treatment of wounded soldiers in the second world war decreased the risk of gangrene of the wound. This allowed time for surgical intervention, thus saving many lives and avoiding limb amputations during the war. There are several ways to cause the destruction of bacteria, through disruption of the external wall or membrane that encases them, or interfering with the internal workings that allow bacteria to survive and replicate. Penicillin antibiotics bind to penicillin-binding proteins on the surface of bacterial cells and block the bacterium’s ability to remodel its wall. Thus the wall is weakened and the bacterial cell starts to leak and die. 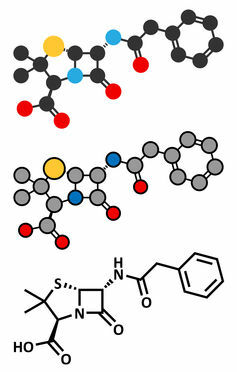 Penicillin has more recently become a class of drugs, which all have a common chemical structure. Penicillin antibiotics belong to a group called β-lactam antibiotics, due to the β-lactam ring that is essential for their effect on bacteria as it binds the antibiotic to the penicillin receptor. 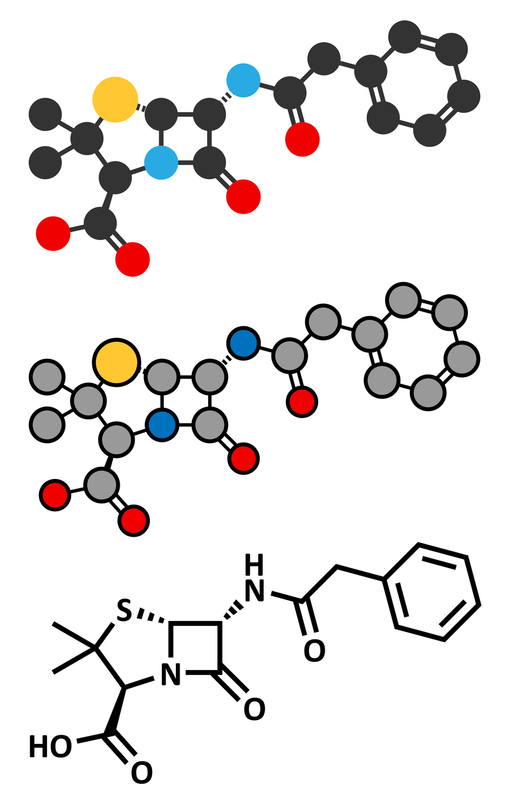 Through modification of this basic penicillin structure, chemists have been able to expand the class to include many of the drugs we use to treat common infections today. If you are on an antibiotic at the moment, there is a good chance it is from the penicillin class. Think Amoxil®, Dicloxacillin® and Augmentin®. Tazocin®, another brand of penicillin, has recently become a commonly used medication to treat severe infections in hospitals due to its ability to kill many different bacteria. Over the past 50 years, since penicillin-based antibiotics have been widely prescribed to treat all sorts of infections, bacteria have started to become resistant with varying success. Bacteria have, over time, changed the target receptor for penicillin, decreasing its effectiveness. They have also started to produce β-lactamases, proteins that disrupt the β-lactam structure of penicillin and inhibit its function. By 1942, strains of Staphylococcus aureus were already resistant to penicillin. Today, around the world, many of the bacteria originally sensitive to the effects of penicillin are resistant. On the other hand, many common bacteria still retain sensitivity to penicillin. Penicillin remains the antibiotic of choice for pneumonia in the community, as common bacteria such as pneumococcus are still overwhelmingly sensitive to penicillin. Penicillin and related antibiotics are still the most common group of antibiotics to treat a broad range of infections from chest or throat infections to skin and soft tissue infections. 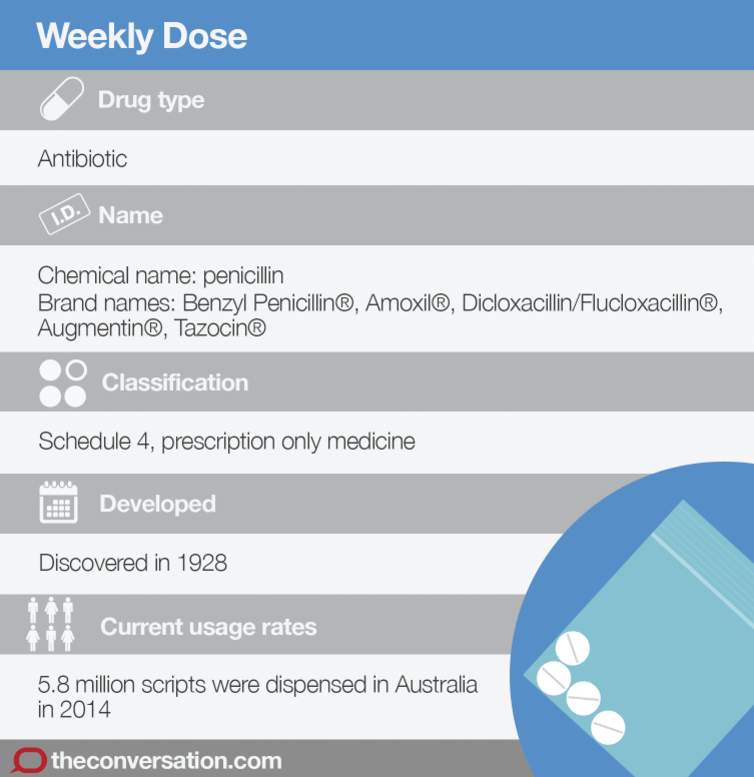 In 2014, Australian patients filed 5.8 million prescriptions of Amoxil alone. The decision to use these antibiotics depends on the site of the infection and the likelihood the patient may be infected by a resistant bacterium. The cost varies widely between the different penicillins from about A$15 for a course of penicillin VK (an oral penicillin) up to A$70 for a course of Tazocin®. However, most are on the PBS, so the price to consumers is A$38.30, or A$6.20 for concession card holders. Penicillin and related antibiotics have been associated with life-threatening allergy known as anaphylaxis. Fortunately this is very rare and occurs in less than 0.03% of patients. Since penicillin antibiotics are commonly used, it is important people differentiate between serious allergy and mild side effects. 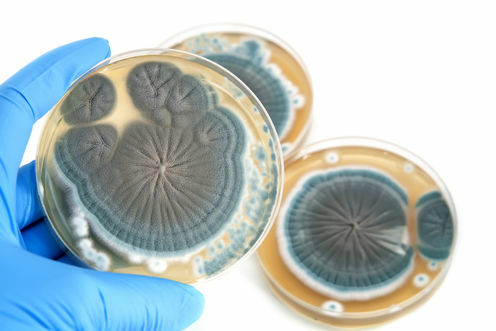 Penicillin is a very useful antibiotic group, so if the side effect is mild it is important to consider a re-challenge under the supervision of your doctor. There may even be cases where it is essential to desensitise patients with severe reactions to penicillin. The penicillins have a broad range of side effects. The most common are upset stomach, with nausea and/or diarrhoea and skin rashes. Rare side effects include liver and kidney inflammation. And, like all antibiotics, penicillins can lead to infection with Clostridium difficile, an organism that causes severe diarrhoea, due to alteration of the normal gut bacteria. Penicillins are generally safe to use with other medications. Occasionally, though, they can modify levels of certain medications such as methotrexate, which is used to treat cancer and autoimmune disorders.